Councilmember Marqueece Harris-Dawson led a groundbreaking ceremony September 8 to mark the beginning of construction of a Los Angeles Department of Water and Power (LADWP) drinking water treatment facility in South LA. Also present were LADWP General Manager David H. Wright, 99th Street Elementary Assistant Principal Marissa Borden, LADWP Water System Senior Assistant General Manager Marty Adams, and Board of Water and Power Vice-Chair William Funderburk. The 99th Street Water Treatment Plant will replace the existing onsite chlorine system with a chloramine system to treat the groundwater pumped and distributed from the 99th Street Pumping Station complex. It will also provide new equipment that will increase safety and reliability for disinfecting the water supply. The facility serves more than 20,000 customers in the Watts and Green Meadows communities. “Access to clean drinking water is essential for all families in Los Angeles. The new 99th Street Water Treatment Plant will ensure that residents of Green Meadows and Watts have access to the highest quality water,” said Harris-Dawson. To meet drinking water quality requirements, particularly the Federal Stage 2 Disinfectants and Disinfection Byproduct Rule, LADWP in the process of converting all of the city’s drinking water supply from chlorine to chloramine — a combination of chlorine and ammonia. Chloramine is safe for every day uses, meets US EPA standards for drinking water, and has been used by utilities in the United States and Canada for nearly 100 years. Converting to chloramine will also make it possible to pump more groundwater from the 99th Street wells and Central Basin, both valuable groundwater sources. “Through innovation, planning and a dedicated workforce, we at LADWP run our operations day in and day out to ensure your drinking water is safe to drink, clean and of the highest standards. 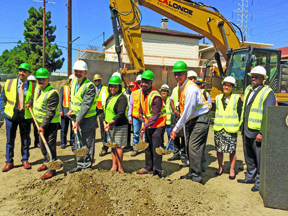 The 99th Street Water Treatment Plant is a critical water quality infrastructure investment and we are pleased to bring it to the South LA community,” said LADWP General Manager Wright. The 99th Street Water Treatment Plant, estimated to cost $19.1 million, is a 2,300-square foot, single-story building constructed within the existing 99th Street Pumping Station complex. Construction will continue through November 2018. The construction site is adjacent to the 99th Street Elementary School. LADWP coordinated with the school and the Los Angeles Unified School District (LAUSD) to ensure that concerns about safety and impacts of construction are addressed, and no fumes or gases are released from the facility. LADWP also recently engaged the school to be part of the Adopt-a-School Program, and offered LADWP water quality staff to be on hand to educate students about water quality and testing. The treatment plant had been in the planning stages for several years and is not directly related to the recent problem of cloudy and discolored water in Watts and Green Meadows. Earlier this year, LADWP received more than 50 calls from customers with concerns about their water quality. LADWP found that the discoloration was due to naturally occurring minerals such as iron and manganese that were disturbed within the pipes. To address the problem, LADWP flushed more than 50 miles of water mains in less than eight weeks and tested the water on a daily basis. Since then, the problem has been resolved, and LADWP has been following up with the customers who called and all other community members including the Housing Authority, schools and LAUSD. The Watts and surrounding neighborhoods have also been served chloraminated water from the adjacent south Los Angeles area since May as a temporary solution while LADWP shut down the 99th Street Wells Pumping Station to address the water quality issues. In 2015, LADWP supplied nearly 200 billion gallons of safe drinking water to 4 million residents and businesses. The water served surpassed all drinking water standards for health and safety set by the U.S. EPA and the State of California, State Water Resources Control Board-Division of Drinking Water. To learn more about water quality in the City of Los Angeles, visit ladwp.com/waterquality.